I am typically very skeptical of most themed Bibles and even most study Bibles. The repackaging of every translation of the Bible into a Bible for men, for women, for kids, for tweens, and even horse-lovers (I'm not kidding, check it out) just smacks of commercialism. Tyndale has avoided this trap and subsequently the new NLT Mosaic Bible is a very beautiful and unique Bible that follows the church calendar year beginning with Advent (See an 84 page pdf if you want to see just how beautiful). The Mosaic portion draws art, quotes, and reflections from various Christian traditions from every continent and in every century. 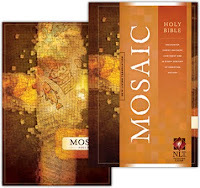 The Mosaic Bible is actually two books in one and, given my aversion to themed Bibles, I initially thought it would be better separated as an NLT Bible and a Mosaic Study Companion. However, the NLT Bible and the Mosaic portion are nicely cross-referenced so that you can easily find passages on a specific topic from the church calendar or art inspired by a text (for instance). Mosaic is a broad sampling from the Christian traditions, though I feel the editors were careful to ensure that the material used actually pertained to the subject matter. This was a potential pitfall as they were using excerpts from writings by such notables as Karl Barth, Albert Einstein, Dan Kimball, Brian McLaren, Erwin McManus, Sufjan Stevens and even J.R.R. Tolkien (yes, Lord of the Rings is in here). While some of it feels a little forced at times (perhaps in an effort to be relevant), it is not so much so that it becomes distracting. 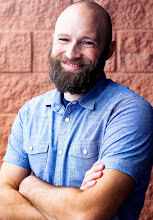 Michael Spencer from imonk.com had a helpful caution to Mosaic readers about the excerpt selection: "A section that oriented the reader to the various traditions and their historical roots and theological distinctives/commonalities would have been useful in seeing just how Athanasius and Brian Maclaren “fit” into a common Christianity. If a user of Mosaic is committed to a “generous orthodoxy,” the approach of Mosaic is positive, but if someone buys the Bible and is in a church where Maclaren or Catholics are denounced or ruled out of orthodoxy, there will be confusion." If most readers are like me, we have largely ignored the church calendar year. However, my wife and I were both so impressed with this Bible that we plan on working through the church calendar together this year. If you have never observed the church year, would like to become more familiar with it, or would like to better understand the wide range of influence from church history and tradition, this might be a good place to begin. Check back tomorrow for a guest post from one of the contributors of the NLT Mosaic Bible and again in early October for a chance to win your own copy!